First of all there’s a lot of confusing terms around that essentially describe how I photograph weddings. 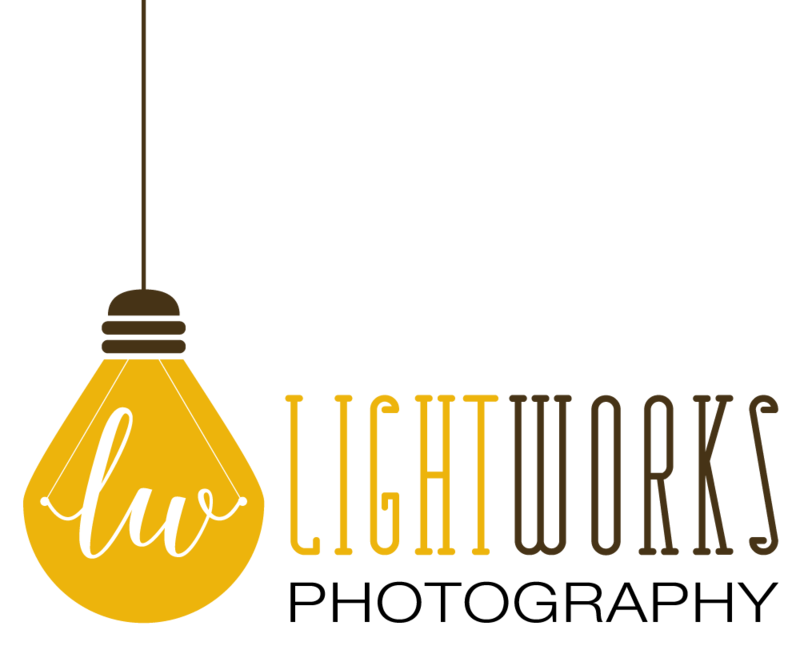 You’ve probably read about documentary wedding photography, reportage and wedding photojournalism for example and these basically all mean the same thing! For me it’s about story telling using pictures, recording natural images without interfering or setting things up. You have probably already noticed on my website that there aren’t any traditional photographs, there’s no posing couples and I haven’t included many detail shots. I do obviously photograph the bride and groom (in as natural and unobtrusive way possible) and of course photograph your table decorations and other details but they aren’t the types of shots that really define my style – they don’t make me tick in a photographic sense! So, let’s dig a bit deeper and I’ll take you through some of the main things makes me as a photographer…well…me, I suppose!………. So in a documentary wedding photography approach there’s no posing, fussing or playing up for the camera! I aim to record everything sympathetically and authentically and make it my job to be as unobtrusive as possible. Most of my photography is completely candid and a number of my wedding clients tell me that they forget that I’m even there – job done! Basically, my aim is to be an invisible wedding photography ninja and to get amazing pictures for you without you even noticing! I don’t interfere, ask people to do silly things or arrange anything for the pictures. I try to be as unobtrusive as possible and work hard to remain in the background and to not influence what’s going on around me. Practically speaking this means thinking about my body language and demeanour really carefully, I use small and discreet cameras and I use very little flash. I much prefer to use natural light as it’s much more interesting! I even make sure that I wear quiet shoes and clothing that will blend in with your guests! All of this allows me to capture the moments that you don’t even notice, often those little candid shots that really are the essence of the wedding and come from me really getting in the action, fitting in and looking for the personality of the day. I love photographing human connections, interactions and communication…….. so the moment above between the bride and her Mum, the fleeting connection below and the subtle glances and expressions that say so much…..
It’s also great fun to get a number of people involved, this is one of my favourites below…..There are always funny candid moments like this at almost ever wedding and it’s just a case of learning where to look! 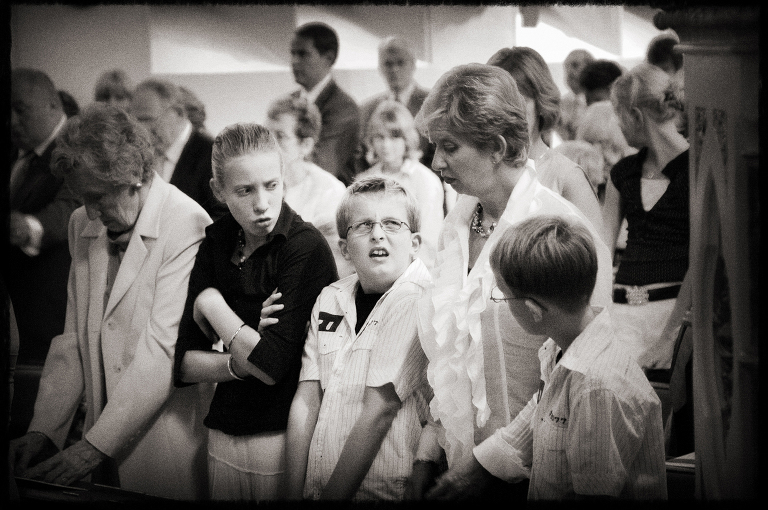 My documentary approach is all about these fleeting moments of interaction, expression and intimacy. They are often extremely short and subtle but go a long way to giving each wedding it’s own individual character and flavour. …….and sometimes it’s a look and a connection just between two people. I really love looking for these “hidden” gems, they occur at all weddings but are fleeting and easily missed but they are well worth working for. I can’t imagine photographing in a more traditional way and missing lovely moments like this. 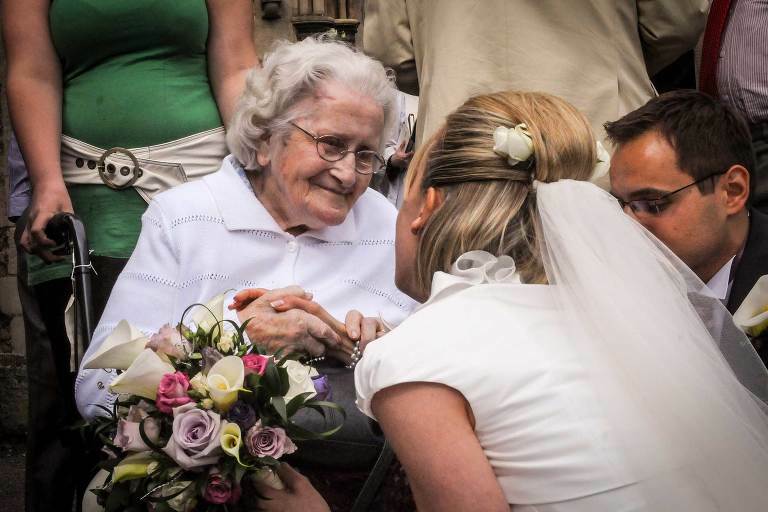 To me this is what weddings are all about – people, interactions and human behaviour. I suppose that in a sort of way I’m a great people watcher and it’s always the people and the stories going on in the background that really make my job as a wedding documentary so interesting! All of this is closely linked to photographing emotion. Weddings are emotional days and again I’m always looking for pictures that convey how people are feeling. Primarily weddings are about love, there’s a link to a blog post I wrote about images of love here, but the images below show all sorts of emotions. Often, at the start of the day, during the preparations there are nerves and excitement, this can move on to elation and relief after the ceremony is over and I am constantly looking to convey this roller coaster in the pictures! The most important thing is that all of these elements hang together to tell the story of the wedding. I like to document events unfolding and try to provide a complete set of pictures that record the emotion and passion of the day for the bride and groom. There has to be continuity and context and the strength of the set of photographs as a whole is much more important than the individual images. I like my storytelling images to have depth to them and to really be multi layered – if I can juxtapose two things or more going on at the same time then I will to give the image a bit more clout! The picture below of the bride doing her make up would have been OK if it was just here but is so much more interesting with the addition of the reflection and the wedding dress in the background…..often, I will try to include as much as I can in the frame to try to tell as much of the story as possible. The classic photojournalists or photo documentary photographer’s lens is close to the field of vision of the human eye and so I try to use that wide – ish field of view to include a number of elements into the picture to give context and depth. ………………….often mirrors, reflections and repeated shapes and patterns help to give a storytelling image a compositional strength and lift it beyond the ordinary…….again this image has a number of different layers…..
………………shapes and repeated patterns always work well too! I’m always looking for ways to make order out of the chaos and to bring the action to life in a clear and succinct way. each image should have it’s own purpose and fit into the whole like a little cog in a much bigger machine – each picture is a small but important part of the whole story of the wedding. …………………..and sometimes a relatively ordinary picture can be lifted by including one special extra element……………….I love the boy’s expression below! Which sort of brings me on to how much I enjoy looking for funny little moments, quirky happenings and all things that are generally a bit strange and make me laugh……! Most weddings have strange little happenings like these and it’s just a case of being patient and looking! Again I think that pictures like this really get to the heart and individuality of each day and it would be impossible to get pictures like this without a considered candid and documentary approach. …………………….this wedding guest looks like he has just passed out – dog looking on with concern……. …………………and sometimes weddings really can be………well……….boring and tedious! If you like what you see we should meet! Now, all of this rather idealistic photo documentary and reportage stuff sounds great but some couples may well worry that they will miss out on other vital parts of the wedding day coverage as well. Left to my own devices I would spend the wedding day in a relatively unstructured way literally photographing events as they unfold and happen and this free form approach affords a great deal of creative freedom and artistic expression which my clients have come to expect. However, to balance this out most brides and grooms want at least some family group photographs, some more posed images of themselves as well as a record of the venue and table decorations and all of the other wedding details that they have worked so hard on. This might seems a bit opposite the the wedding photo documentary approach but, with some planning and careful thought a balance between the two can usually be worked out. Essentially it’s to do with timing and anticipation and there are naturally some parts of the wedding day where there is less people photography to do when it can be an ideal time to photograph the table decorations for example. Often, there is a slight emotional lull just after the wedding drinks reception has started. Usually the bride and groom have just arrived and there is a flurry of chatting and congratulations but then things start to settle down a little as guests start to chat. For me this is a great time to take a few minutes away from the wedding party to photograph the tables and cake etc as I know the chances are that I will not be missing much of the action. A little later, as people get settled in an a little more alcohol has been consumed then the party will pick up again and it’s back to photographing people! I also try to photograph the wedding details in context and rarely move or adjust anything. As a documentary photographer I consider it my job to record things as they are rather than to influence or interfere and this idea often leads to photographing bouquets whilst being held and shoes being worn, for example, rather than setting these types of images up more traditionally as still life type photographs. Again this takes a little less time than a more traditional approach and allows me to concentrate on the storytelling pictures of the day as it unfolds. This is a slightly different approach from other photographers who may well offer a degree of reportage, photo journalistic or documentary work in their coverage but it may well be only one element in a blend of different styles. Most wedding photographers are extremely versatile and many are incredibly good at adapting to different styles of photography during a wedding day. It’s just a case of deciding on what emphasis of style you would like. A documentary wedding photographer will place a heavy emphasis on this style and a more editorial style photographer for example would put a much stronger emphasis in that area of their coverage. As you can see this relatively free or unstructured approach is in fact extremely considered and well planned! I strongly believe that to get in the right creative mindset and to become really emotionally involved in the wedding you have to be able to forget thinking about logistics and such like and be able to fully concentrate on the job in hand. That’s why I always have a planning meeting with each couple before the wedding to find out exactly what will be happening and where so that I can plan my day and increase my chances of getting great “unstaged” photographs for them. This meeting includes discussing who the main important people are at the wedding and allows me to get to understand the links and relationships between guests and the bride and groom. This is vitally important because what looks like a relatively insignificant moment can be extremely important and poignant if you know the context within which it happened. 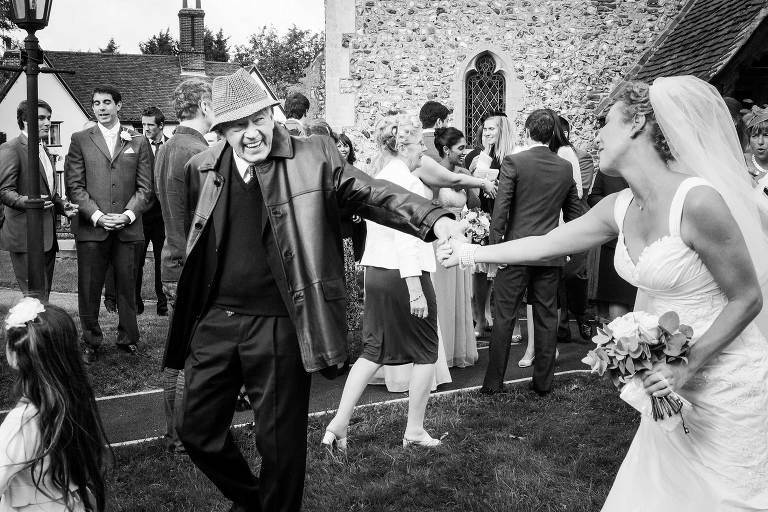 As an example I once photographed a wedding where, due to my forward planning and taking time to get to know the couple, I had found out that the bride hadn’t seen her grandfather for a significant amount of time and that them meeting at the wedding would be an emotional and important moment. It would have been an easily overlooked moment had I not been looking for it but, shortly after coming out of church I photographed them in an emotional embrace perfectly framed and surrounded by guest’s umbrellas in the rain. It’s a good but not spectacular shot but one which has great meaning! It’s this type of thing that makes the documentary approach all the more special and I truly believe that genuine moments like these only become more and more powerful as time goes by. You can see more of my documentary wedding photography approach by visiting my portfolio here and also by looking at some of my featured weddings here. If you like what you see and my approach appeals then GET IN TOUCH – I would love to hear from you.